These pumps are very reasonable to maintain, generally requiring only replacement seals every 5 years. The come with a 5 year parts guarantee and a 50 year useful life! Made with aircraft-grade stainless steel and aluminum with graphite-impregnated bronze bushings at the three pump-head pivot points, adding outstanding durability. Planning a vacation? These pumps also have the option to remove the pump lever and lower the pump head for those times when you’re away from you property and want to secure your water (see image at right). Be Ready When the Power Goes Out! We all know there’s a good chance at some time we will experience a power failure. What’s the first thing you need and cannot go without? Water. Having this Hand Water Pump means you’ll always have a readily available water supply. 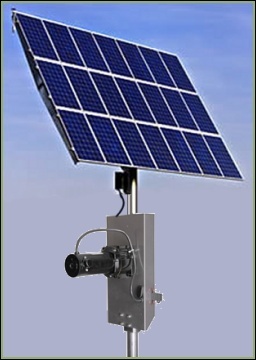 Whether you choose to install this right alongside your existing submersible pump to use as a backup or prefer to go off-grid with this as your primary hand pump (Yes-this pump also offers a solar-motorized option! ), you can rest easy knowing you’ll have water for your everyday needs even in a power interruption. The efficiency of this pump allows it to run off a single solar panel. Most hand pumps are limited to about 25 feet. Deep wells are not a problem for this pump-it pumps from up to 350 feet water level. Most other hand pumps can’t fit alongside your existing submersible pump. This one can. 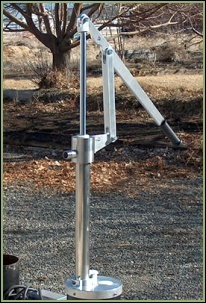 Most other hand pumps don’t offer the option of a motorized or solar motorized version. This one does. It delivers up to 5 gallons per minute into your pressurized plumbing system and delivers around 45-50psi. With the Simple Pump, you will be able to get fresh drinking water, shower, use the toilet & wash your dishes. And you can switch between a motorized pump and a hand pump in minutes-and back again too! 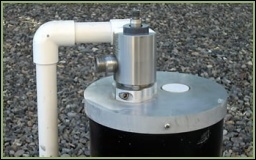 Want more information on this innovative water well option? Contact us directly. We’ll be happy to offer our expertise.